I have been reading Melissa Clark recipes as my bedtime stories this past month, and I was intrigued by a recipe she described for a granola made with olive oil. Sweetness from brown sugar, earthy undertones from the olive oil, you understand why I bookmarked the page. But you know that thing that happens sometimes, where you never heard of something and then once you learn about it you see it EVERYWHERE? Turns out, suddenly there are variations on this recipe for olive oil granola all over the interwebs. And tonight I learned why. Because it’s good. So good I could hardly stop stealing pinches off the tray–and that was before it was baked. You might want to make it this weekend–if you can wait that long. Of all the nearly-identical recipes, I started with this one, which was pretty much pared down to the essentials already, but I simplified it one step further by eliminating the coconut, which is not my thing. If it’s yours, add a cup of coconut flakes to the recipe below. Like most granola recipes, you can vary the nuts and seeds and/or add fruit to suit your taste. Preheat your oven to 300 while you get a big bowl and mix 3 1/2 c. oats with 1 c. each of raw pumpkin seeds and raw sunflower seeds and 1 1/2 c. whole pecans. Pour over 1/2 c. brown sugar, 1/2 c. olive oil, 3/4 c. maple syrup and 1 tsp. kosher salt and mix well. Divide between two sheet pans and bake until nice and toasty, about 30 mins., switching the pans and stirring well every 10 minutes. Let cool completely before storing in an airtight jar. Eat by the handful from said jar. Or, if you want to get fancy, you could put your handful of granola in a little bowl first. p.s. As you may have guessed, this granola is not exactly health food. If you’re looking for an everyday recipe with a lower proportion of sweetener and fat, you might like this Almond and Dried Cherry Granola recipe. This entry was posted in Baking, Breakfast, DIY, Easily Multiplies to Feed a Crowd, Vegan or Would-Be-Just-As-Good-Vegan and tagged baking, breakfast, children, cooking, food, lifestyle, recipes on January 26, 2012 by emmycooks. Yes, I have been seeing recipes for olive oil granola everywhere, too! I make granola and granola bars often (actually made some this week), but I haven’t tried with olive oil yet. I love pecans, though I am curious to know how pistachios would play with the other elements in this recipe. yummmm I’m going to have to give in and make this. I’ve seen the recipe before but never made it because I knew I’d eat the whole batch in one day! Thanks for the nice comment on my blog :) I’m looking forward to reading your posts as well!! I love a homemade granola! On my list to prepare this weekend. Thanks for the recipe! Glad to hear so many people are going to be going to be making and enjoying this soon! 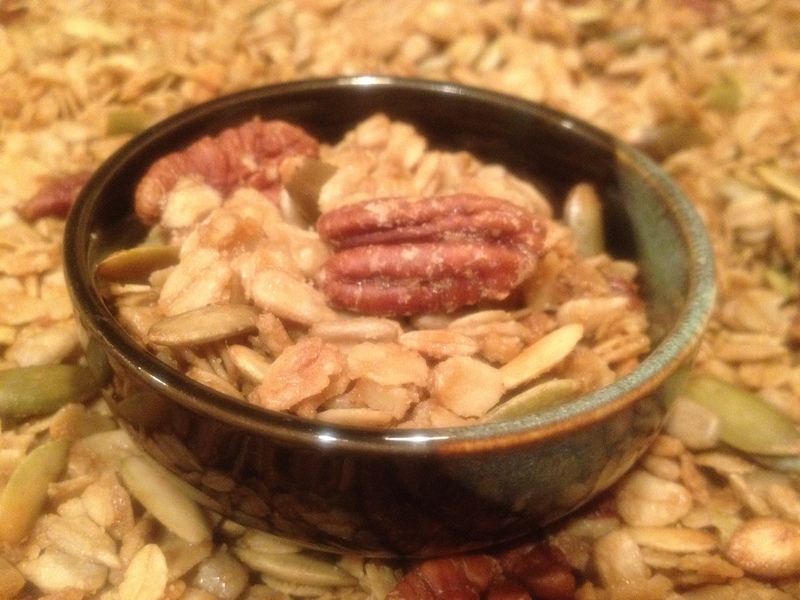 magicinthekitchen, I think this granola would be great with most combinations you could dream up–pistacios and apricots! Raisins and walnuts! Almonds and dried cherries! I will update the post to mention that. Thanks! That is my favorite granola recipe. I make huge batches of it at a time and freeze it. SO good! It never occurred to me that you could freeze granola! Thank you so much for the tip. Knowing that, my next batch will be huge as well! Never even heard of olive oil granola! I usually make the exact same granola recipe every single time, but I think today I’ll branch out and try this one. Looks yummy. I hope you liked it! This one is J’s favorite and a house staple these days. But of course! I like granola because it’s pretty flexible and not as scary as other baking where small deviations from the recipe can be disastrous. You can definitely try cutting back on the sweeteners; at a certain point you’ll lose some of the crunch but you’ll have to experiment to find the sweet spot where the flavor, texture, and sugar content are just right for you. Let us know what you come up with!